Covering the Mac operating system, OS Yosemite, Mac Basics in easy steps shows you how to get up and running on your Mac with minimum time and effort. Useful for anyone new to the world of Mac computing. 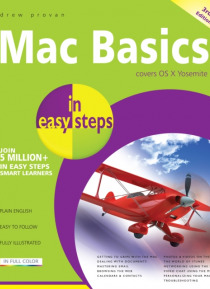 Mac Basics in easy steps covers all the essentials a novice needs to know, from getting started to security issues. Areas covered include: Getting to grips with the Mac; Dealing with Documents; Ma… stering email; Browsing the web; Calendars & Contacts; Photos & Videos on the Mac; The world of iTunes; Networking using the Mac; Video chat using the Mac; Personalising your Mac; Troubleshooting. This handy guide even shows how to move over from a PC - in easy steps - with minimum hassle. Covers OS X Yosemite.